For the past four years, I've been collecting, sniffing and writing about vintage perfume on this blog. I've done it as a labor of love (as I hope is obvious! 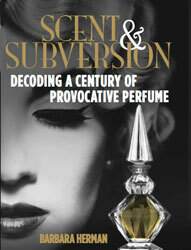 ), and I'm grateful that I get a chance to pour more of that passion into my new book, Scent and Subversion: A Century of Provocative Perfume (Lyons Press, 2013). As you perfume lovers know — vintage perfume ain't cheap. Even a decant of vintage perfume can be $20 for 1 ml; forget the rare bottles! I've spent a small fortune over the years collecting this stuff and sharing my thoughts about it, and if you've enjoyed what you've read here and learned about vintage perfume as a result, perhaps you could contribute to the fundraising campaign I've started on Indiegogo. I'm almost finished with Scent and Subversion, but I still need to travel to interview perfume folks (in France and Germany), and I still need to acquire the remaining perfumes and perfume ads to complete the book. Indiegogo is a crowdfunding site like Kickstarter. Using the Indiegogo platform, I describe the project I'm raising money for, provide a fundraising goal ($5,000) with a time limit (35 days), explain how I'll use the money, and offer "perks" for each level of contribution. Contributions start at $5 (every bit helps! ), and each level is matched with gifts at that contribution level. There's also a video on Indiegogo that talks about Scent and Subversion and shows some of the gorgeous ads that will illustrate it. If you're not able to contribute financially, I'd really appreciate it if you could consider forwarding this link to your friends, family or anyone you think might be interested in supporting the culture of perfume. Thank you, and please check out Indiegogo! P.S. That's not the real book cover; I'm not sure what it will look like yet! Oh, but that would be a fabulous cover!!! Cheryl Q: I know, right?? Well see what the publisher and designers and I come up with! Sadly, Indiegogo seems to decline transactions (this time, contributions)from certain parts of the world. Nigeria, in my case. All the same, i wish you all the very best. The cover though connotes vintage. I like it! I've been collecting scents for several years too, and if I can help in any way regarding some of the obscure vintage ones, I'd be more than happy to contribute. My list of my goodies is so huge, it would need to be sent through to you as a PDF attachment... if I can get hold of an email address for you I would be happy to send it through. What a wonderful idea! I can't wait for your book! By the way, how can I contact you? I would like to send you something. Hi Dark Moss (love the name!) I'm at yesterdaysperfume@gmail.com. Looking forward to your message! Good job at raising the money.